A couple weeks ago, a customer at Five in One Social Club on Broad was hungry. Where should she go to lunch?, she asked the owners. What about Bounty? The owners suggested the newly open Liquor Store, as Broadway Pizza was the only place in the area serving lunch. It was a scenario exactly pictured a few years back by Lisa and Luis Toro of the high-end gift and coffee shop City & State. 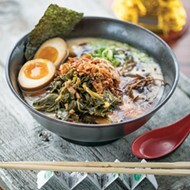 When a liquor store just about a block away from City & State became available, Toro kept her eye on it, sure that other folks could see the wide-open market for a breakfast and lunch place. No one did, so Toro took on the project herself, opening the Liquor Store. "There was a black ceiling, black wood beams. There was no plumbing," says Toro. What it did have, according to Toro, was "such personality, such character. "The sign's iconic." What Toro envisioned for the space was "mid-century Miami" — bright whites and playful palm leaf prints of Toro's own design. The mood she was going for was "happy." Happy, indeed. Folks can follow their bliss down the cocktail menu with its trio of toast-worthy champagne drinks. 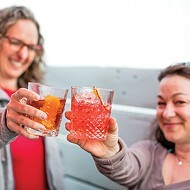 There's also the intriguing Negroni Bianco with pisco, cocchi Americano, port, vermouth, bitters, and palo santo — described as "a spirit-forward brandy cocktail with a mysterious smoky finish." The breakfast menu, available all day, includes classic egg plates and pancakes as well as biscuit sandwiches. For lunch, vegan and vegetarians will most certainly tuck into the Cuban Platter, a colorful array of fried plantains, black beans, yellow rice, and other veggies. More Latino/by-the-sea influence is seen in the crab cakes with a lime vinaigrette and the fantastic Dulce De Leche cake from Ali Rohrbacher. Next up for the Toros is expanding the smallish space. The plan is to add storage containers for a bar and a patio area in the back. 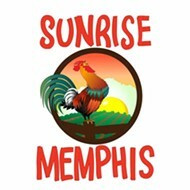 Sunrise opened on November 27th downtown, more than a year after it was supposed to. The founders held a "soft opening" the week beforehand to work out the kinks. One thing they adjusted was the biscuit recipe. They reworked the recipe to make it hold up better to the ingredients — ingredients such as house-smoked sausage, eggs, chicken, cheese, pork shoulder, steak, and pickles. 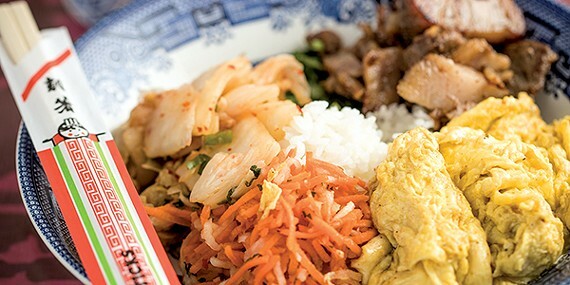 Other dishes include the Bim Breakfast, a popular dish with pork, scrambled egg, kimchi, scallion, daikon served over sticky rice. The Three Amigos Tacos are breakfast tacos with eggs, chorizo, potatoes, cotija, salsa, and jalapeños. The menu, says manager Johnny Lawrence, "goes a little against tradition. We were not anticipating the [Bim Breakfast] to be the best-seller. The Chicken biscuit is doing well. It's not your everyday chicken biscuit. Its cajun batter is super crispy, a little spicy. It's very Southern." Another thing worth crowing about is Sunrise's house-smoked meats, specifically the salami and sausages. They took advantage of the old smokers left behind by the Neelys, who used to operate a restaurant in that space. Sunrise serves exactly one type of beer — Miller Lite. Miller Lite is a favorite of Sunrise co-founder Ryan Trimm (along with Craig Blondis and Roger Sapp). Miller Lite also makes an excellent Beermosa, according to Lawrence. As for the space itself, it's comfortable with tables and chairs painted by local artist Karen "Bottle" Capps. A jukebox is stacked with classics (Cash, Redding, Parton, etc. ), and there are no TVs. Lawrence says that business has been pretty good so far, and booming on the weekends. They modeled Sunrise's approach after Central BBQ, an establishment that knows how to pack people in and get them fed in an orderly fashion. "It's the brainchild of three native Memphians," Lawrence says. "It's held true to what the city is about — blues, Sun Studio, and Elvis."